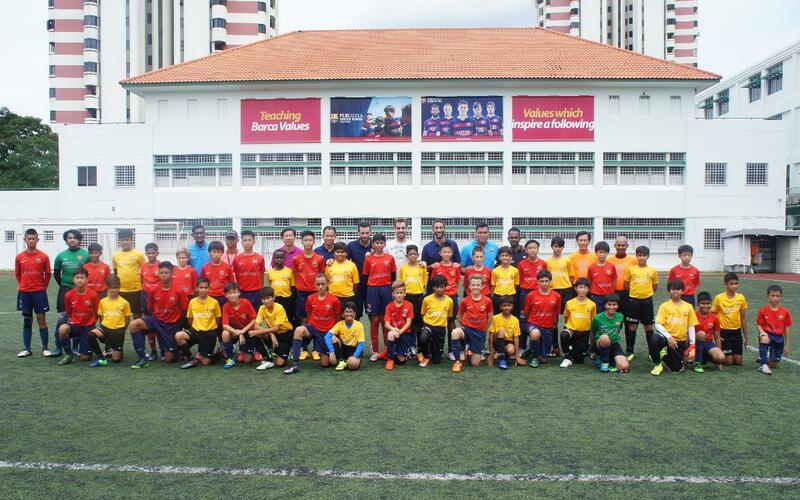 The players of the FCBEscola Singapore have been magnificent hosts towards their New Delhi colleagues ahead of the Singa Cup, and they celebrated a great day with two friendly matches. The games were held at the St. Patrick School facilities between two U12 sides of both schools and were met with the visit of the FCBEscola Director of International Projects for Asia and Oceania, Toni Claveria. The games started with the Barça hymn ahead of the presentation of the players which served to motivate the youngsters. The kids spoke of their joy at playing against a team from a different country who also shared the Barça philosophy. The directors of the Singapore and New Delhi schools, Ángel Toledano and Aitor Olmo respectively, said that “the children had a blast where the Barça approach was on display”. Toledano highlighted that “a great game was witnessed on the part of both teams, always trying to maintain possession of the ball, as well as good friendship being on display”. Olmo said that the experience was “very positive and the boys ended the game delighted” wanting to repeat the friendly in India.